Clip Strip - 12x28g. Buy 2 for £20. NO VAT. Snacking Salami 'Chilli & Paprika'. For those Serious about a nibble! 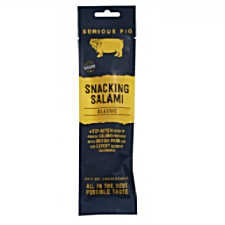 These authentic salamis are prepared from finest British Pork and a careful blend of herbs and spices that truly pay homage to the craft of charcuterie. From unwinding at your local to an on the go lunch break, these two delicious flavours can be enjoyed anywhere. We all like spice in our life but, of course, it has to be balanced. 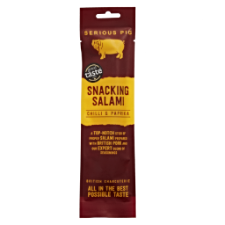 The level of chilli in this salami delivers a sharp piquancy that together with the smoked paprika creates a deep, rich flavour.